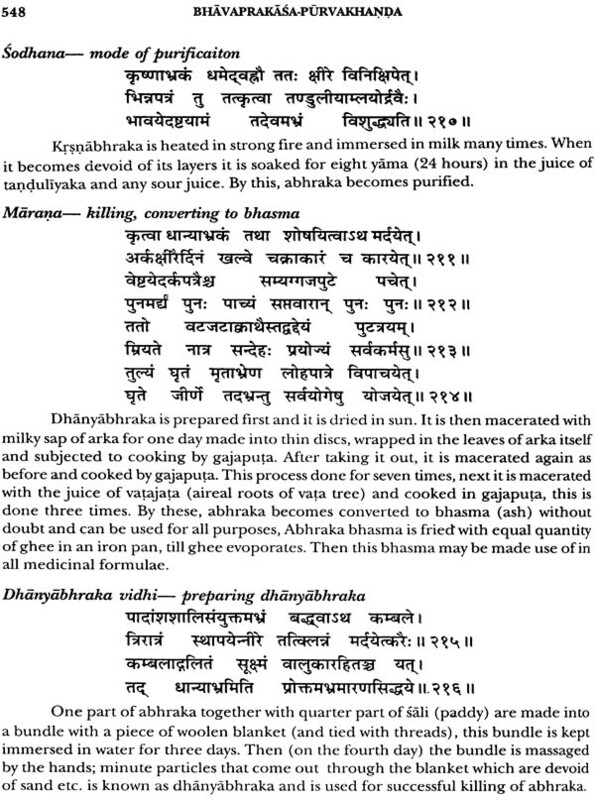 Bhavaprakasa written by Bhavamisra is an authoritative text on Avurveda and is being studied by students, teachers and Practitioners of Avuri-eda since last five centuries. It is Comprehensive, dealing with basic doctrine, etiology svmptomatologv and treatment of all diseases. 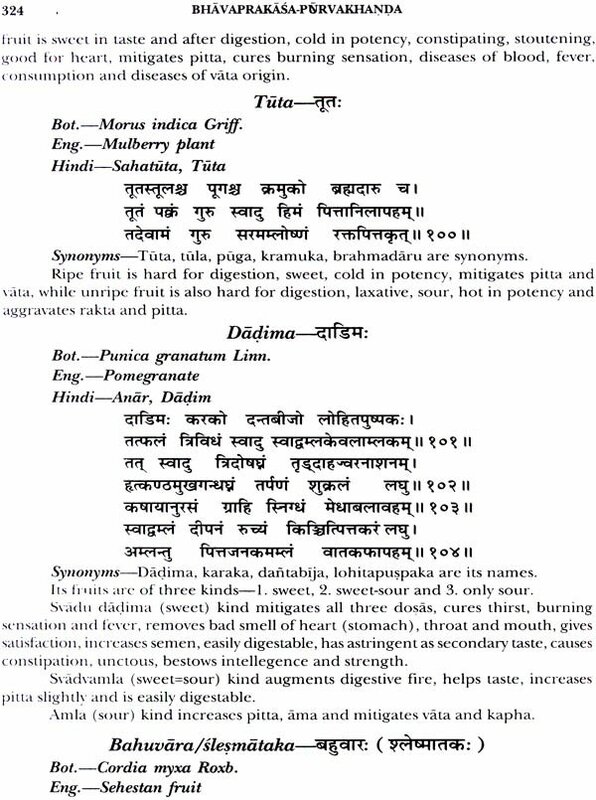 It describes about 500 drugs belonging to vegetable, mineral and animal kingdoms, this lexicon of drugs (Nigharnu Bhaga) is considered as a specialty of this text since it incorporates many new drugs unknown in the ancient period. 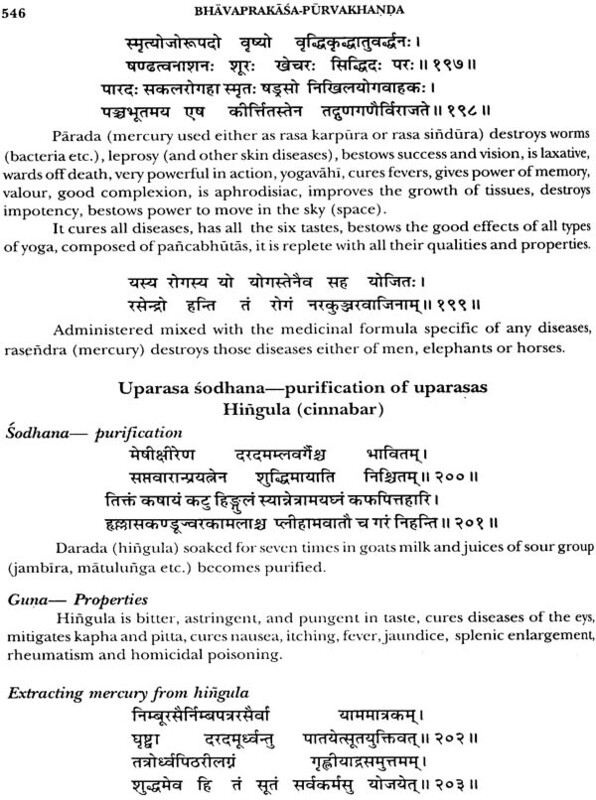 In the treatment of diseases both Kasthausadhas (Vegetable drugs and Rasausadhas (mercurial and mineral drugs) have been prescribe Sixth all these merits Bliavapral-isa has been a rem- popular text.. Need for its English translation was being keenly felt specially by Postgraduate students, This translation sustain Trisection. The translator ProL Srikantha Murthr is a person rich in experience of teaching Avurveda and writing valuable books. His ever translations into English of Shnadhara Samhiia, Madhava Nidana Ashtanz-a Hridava and Ashtara Samgraha have earned for hiz an international reputability this breaks is the next in that series. 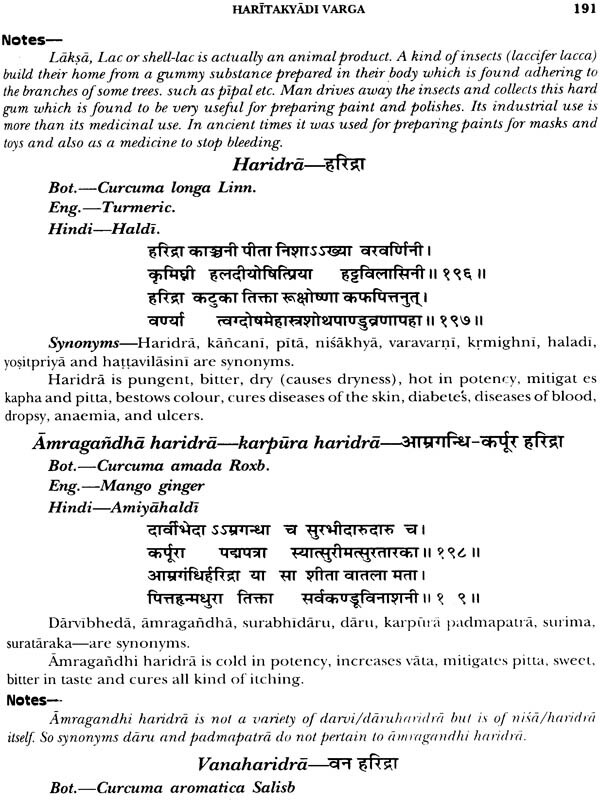 Each volume will have many appendices and index - Prepared so as to be rem useful for all Ayurvedists. 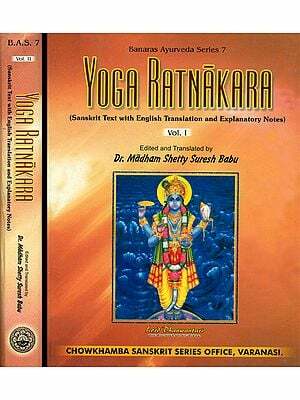 This second and final volume of translation of Bhãvaprakãa, comprises of Madhya and Uttara Khanda, (middle and last sections) of the text. Madhyakhancla has 71 chapters divided into four parts and deals with diagnosis and treatment of diseases of the first six branches of Ayurveda. 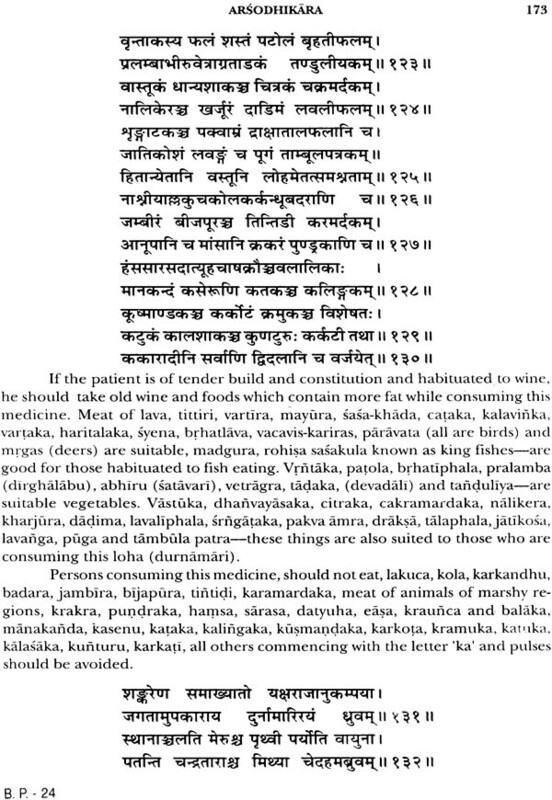 Uttara khanda has only two chapters, one each for Vrsa (vãjikarana) andJara (rasayana) Total number of chapters of the entire text isthmus - 80. Description of diseases includes aeitiology, symptomatology, prognosis and treatment in detail. In treatment, both KAsthausadhas (herbal formulae) and Rasausadhas (mercurial and metallic (herbomineral formulae), have been mentioned. Procedures of preparing some of these have also been described. For majority of Rasauadhas, Bhãvamira has even mentioned the source (text) from which these have been borrowed. 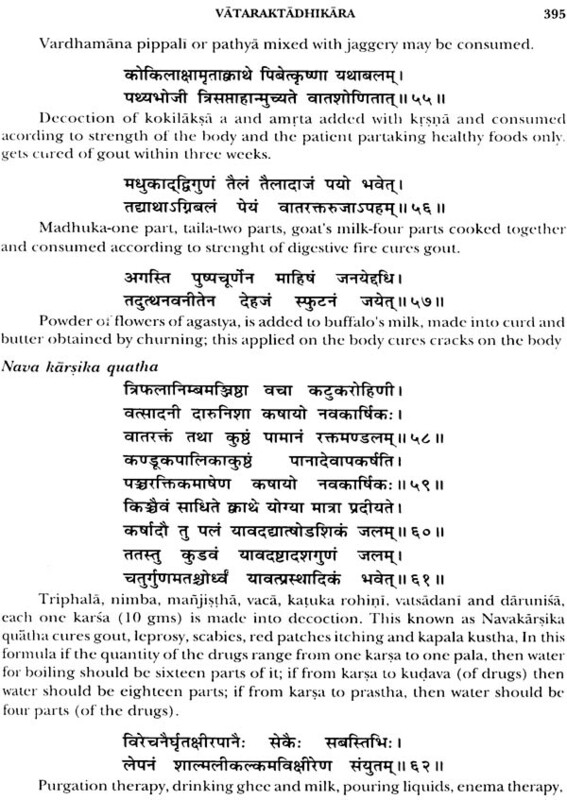 In addition to medicinal formulae culled from earlier classical texts, Bhavamira has given good number of anubhüta yogas (formulae found effective by experience) which includes Ekauadha Prayoga (single drug treatment). With these merits Bhãvaprãkaa is a very valuable book for parishioners of Ayurveda medicine. Similar to the first volume, this also is a faithful translation for the meaning of technical terms and identification of some drugs. 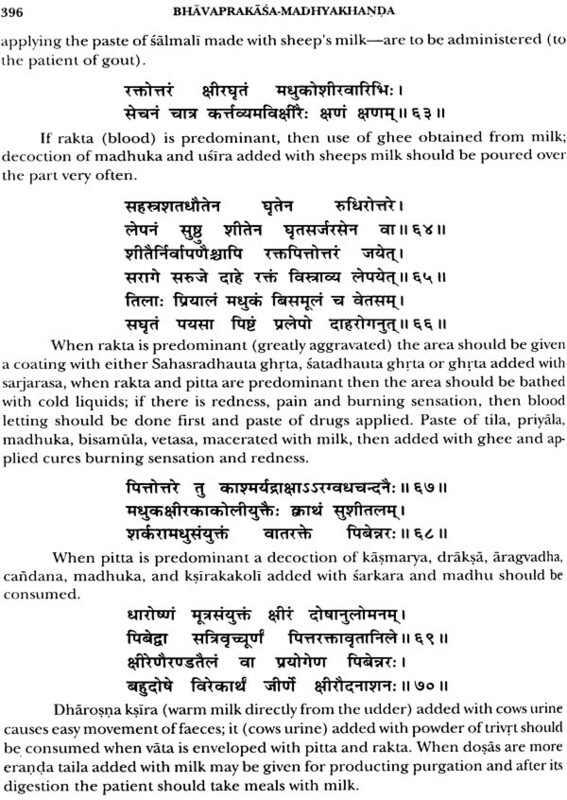 I have solely depended on the commentary of Bhavamigra, since he differs here and there from the views of earlier authorities especially in interpreting names of drugs on these points. So this translation provides a glimpse of the commentary also. I have added my own notes where necessary to explain the subject matter. Readers may refer Vol. 1 of my translation for Botanical names of drugs. Necessary appendices have also been furnished for ready reference. Bhavaprakaa has been translated into Hindi and some other Indian languages but had riot been translated to any foreign languages so far. My translation of the complete text in English is the first in that direction. With the publication of this volume, I have completed the task of rendering the Laghu trayi - “Three minor authoritative texts” of Ayurveda into English. I hope these will help the students, teachers, research workers of Ayurveda and even others interested in ancient Indian Medicine. I feel my labours amply rewarded, if this work creates an ardent interest for further study. I have dedicated this volume to my earlier colleagues, Dr. Shyamalamma and Dr. M.A.T. Narayan - senior physicians Govt. Ayurvedic Hospital, Mysore, who guided me at the beginning of my official career. Dr. Shyamalamma was elder to me by many years and a senior physician. I was then the junior most. Still she developed affection towards me like a mother. She was an efficient Ayurveda physician and patients used to come even from far off places seeking her help. She was a very kind lady and looked after the treatment of her patients with utmost care. Many times she paid money from her pocket to poor patients to purchase the required medicines and food. I have learnt much from her on the many methods of treatment, appropriate usage of medicinal formulae. As her affection deepened, she used to invite me and Dr. Narayan to her house for every happy occasion - big or small, to share the joy and sweet relishing food, together. I owe a debt of gratitude to this noble lady. Dr. M.A.T. Narayan, helped me, learn the management of In-patient wards, maintenance of hospital records, looking after preparation of medicines in the pharmacy, storage and mainline of accounts etc. He had an expertise on these subjects and taught me with great friendliness. I am highly obliged to Dr. Narayan for all his guidance and help t the start of my official career in a major government Institution. Dedication of this volume to these two senior colleagues is just a token of expression of my gratitude to them. Ere concluding I convey my hearty thanks to my first daughter Smt. KS. Revathi, B.A. who has typed the manuscripts with great devotion. I also thank my second son-in-law Sri. G. Mahesh for his help in preparing the Appendices and Index. I am beholden to Sri B.M.D. Gupta of M/s. (Thowkhamba Sanskrit Series Office, Varanasi. the reputed Ideological publishers for bringing out these volumes through their Krishnadas Academy. Bhãva Prakãa is an important treatise on Ayurveda, being counted as one of the “Laghu Trayi” (little three classical texts). It continues to be studied by students and practitioners alike, since a long time. 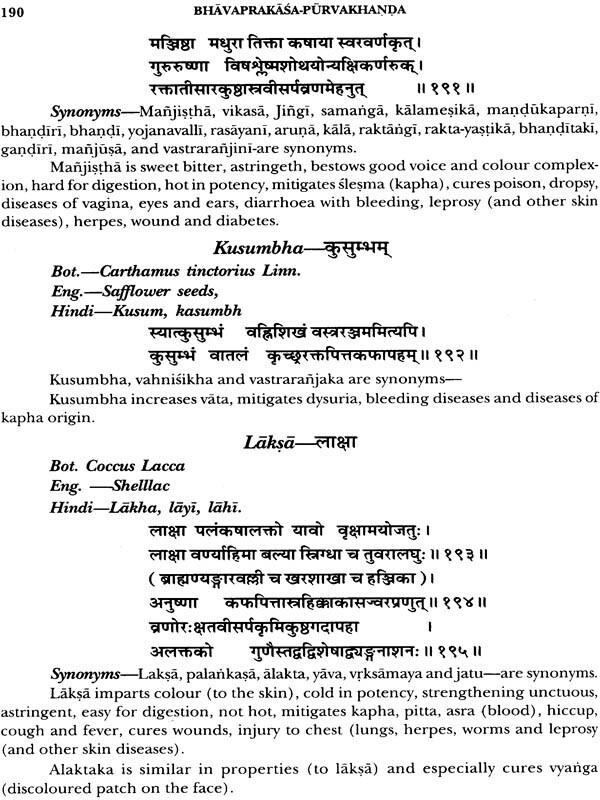 In the invocatory verse the author gives his name as Bhãva mira’ and in the colophon of each chapter, mentions his father’s name as Latakana mira2. Apart from these two names he has not furnished any information about his date, province he belonged to, place of residence, professional and literary activities etc. in this book. Three more books written by him are or own but are not available in print. Whether these contain any of his whereabouts is also not known. So what we now know about him definitely is very little. 1. Bhãvamira was an orthodox Brahmin—his surname “mira” being used especially by brahmins only, his reverential mentioning ofthe names of many Hindu gods such s Brahma, Visnu (Sripati, Madhusüdana Han), Mahevara (Hara, Siva) Gane Surya, Agni (pãvaka) Hanurnañta, Angaraka, Ganga, Bhüdevatãs (brahmanas) etc. 2. 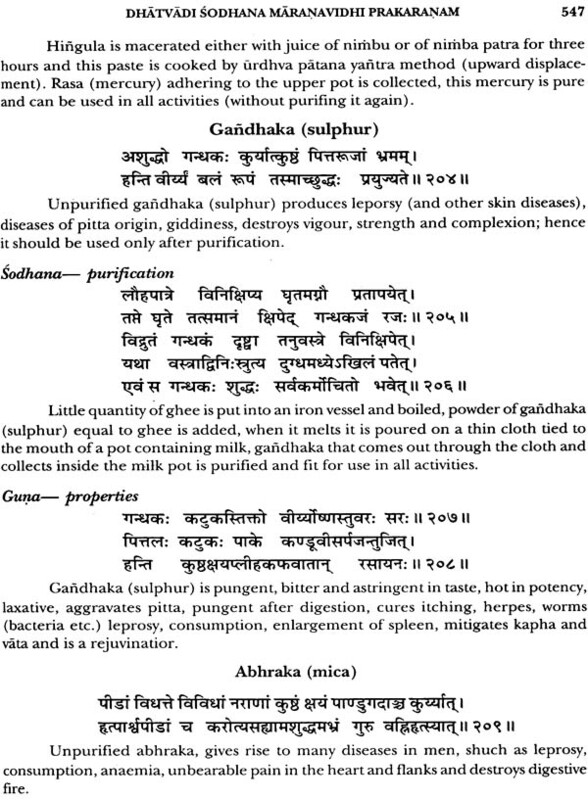 He belonged to Magadha (south Bihar) since he gives the names of many kinds of menu (cooked foods) known only in Magadha (lower and middle parts of Bihar)3. .
4. He was an independent medical practitioner since he does not make mention of any king or chieftain-either Hindu or Muslim as his patron or benefactor. 1. 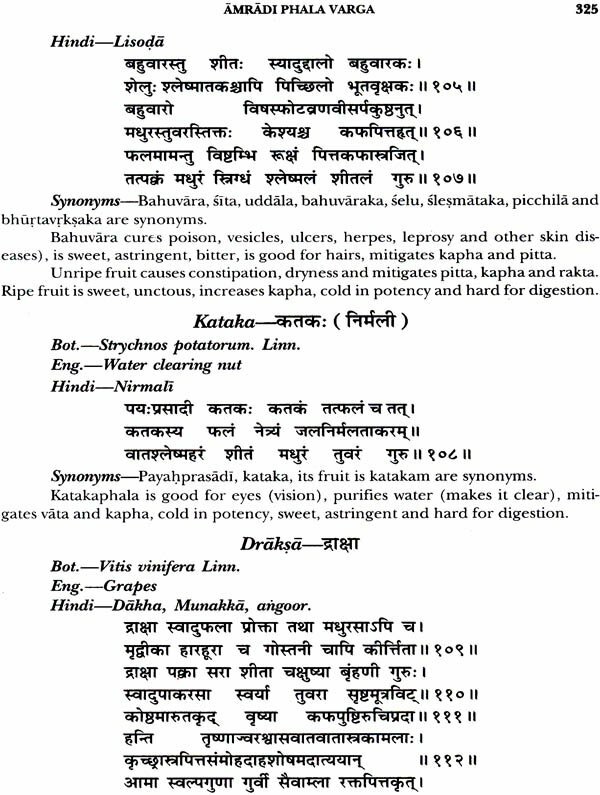 The last text from which Bhãvamigra has quoted is Madanapala Nighaiu. This was complete in 1347 A.D. (14th cent. A.D.). So this will be the upper limit for the date of Bhãvamigra. 2. Yogaratnakara and Vaidyajivana (Lolarnbarajiya) both texts belonging to 17th Cent. 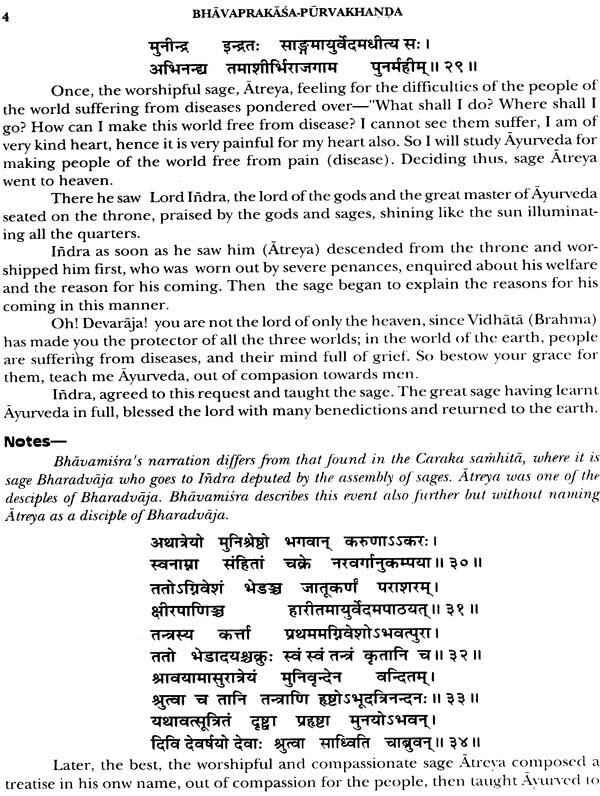 A.D. have quoted verses from Bhavaprakãa. This date forms the lower limit. 3. 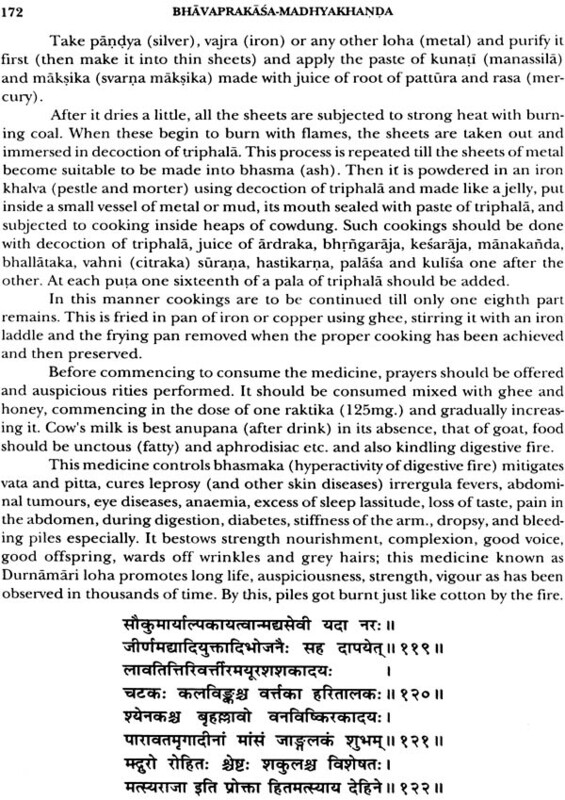 Bhãvaprakaa is the First text of Ayurveda to describe phiranga roga (syphilis) and suggest chopping (smilax china/china root) as a remedy for it. Phiranga roga came to India through the Portuguese and the French in 15th Cent A. D. It was in 16th Cent. only it spree td widely forcing patients to seek medical aid. 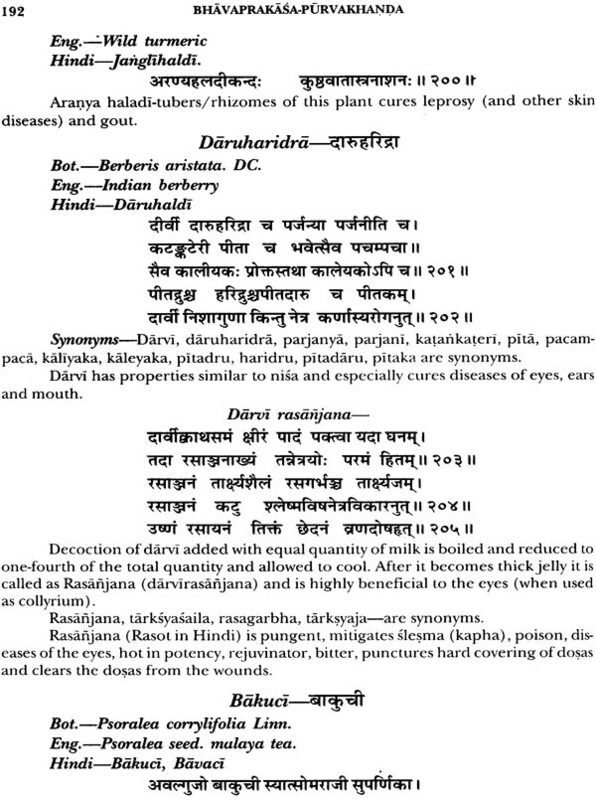 Texts of Ayurveda, Unani and other medic cal systems written during or after 16th cent. A.D. only contain detailed description o1 this disease and its treatment. Considering all these points Bavaria is placed in 16th Cent. A.D. without much doubt. Works Four books written by Bhãva mira have been known so far-vizI. Bhãva prakãa-probably his first work now available in full along with a commentary in Sanskrit Both printed. 3. Mãdhava nidãna imparity-Mss. available2. 4. Vaidyanighantu-not traced so far3. Bhãva Prakãsa is comprehensive in nature containing all important aspects of Ayurveda-ctoctrinai and applied-blended together. The author himself has stated at the outset that very important information’s and efficacious medicinal recipes have been collected from many reputed ancient texts and put in his book4. The book is composed entirely in Sanskrit verses of different meters. It is needless to say that many verses of other texts have been incorporated, sources of many such borrowings mentioned either in the text or in the commentary. 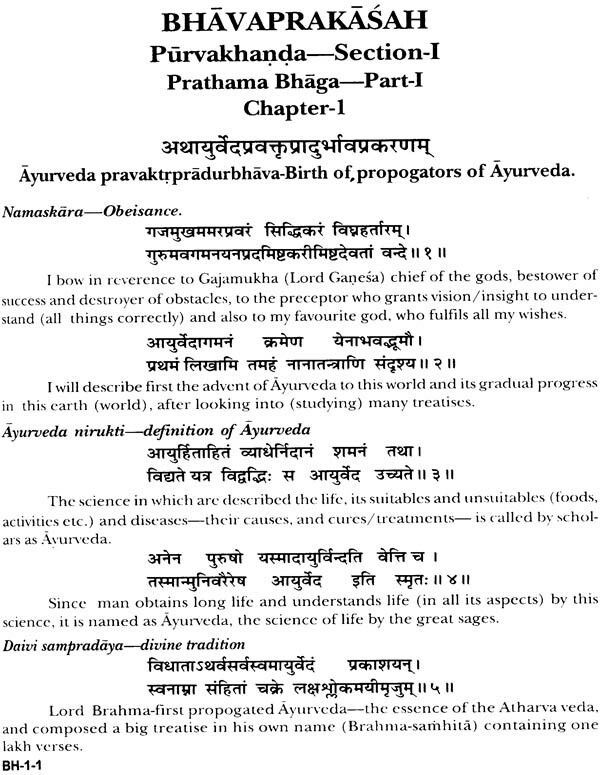 Pürva khanda (first section) has seven chapters and deals with origin of Ayurveda- chief gods and sages propogating it— Lokassti-pañcabhüta triguna-Atma; Iñdriya- manas; Garbhotpatti—Sarira anga-avayava-Dosadi vijñana-Dinacaryã-rtucaryã- sadacara-rogakaraiia-cikitsapada Sa.rasa guiiakarma—Auadha dravyas-sangrahaiia pratinidhi-au adha ãhãra dravya varga (groups of drugs and articles of diet- Nighaubhaga). 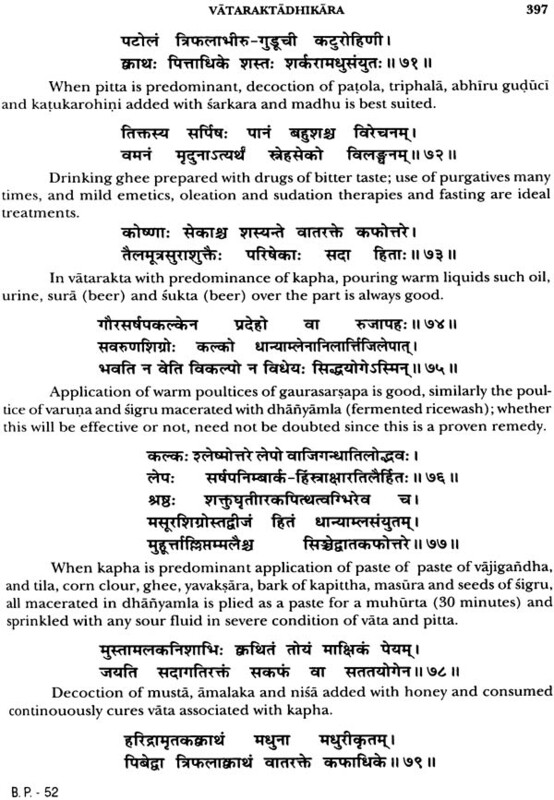 Description of different groups of drugs and articles of diet is dealt in 24 (twenty four) vargas (groups) which form part of chapter 6 is considered the speciality of Bhãvapraka.a. The author frunishes names, synonyms, names in different regions, properties and actions, tests, etc. of drugs of all categories (vegetable, animal and mineral origin). Apart from the drugs which are in use since long, many new ones which have come to India through western countries and those used in Unani system of medicine have also been incorporated in this text. 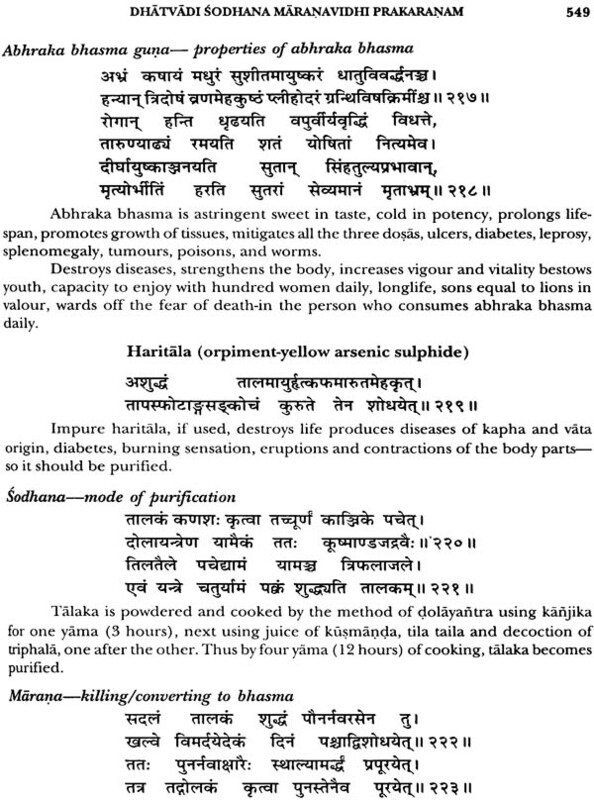 Hence Bhavamira is given the credit for enlarging the materia n-iedica of Ayurveda with addition of new drugs. This portion of the text is known popularly as Bhãvaprakãa nighantu and has been published seperately with detailed notes by many present day scholars’. 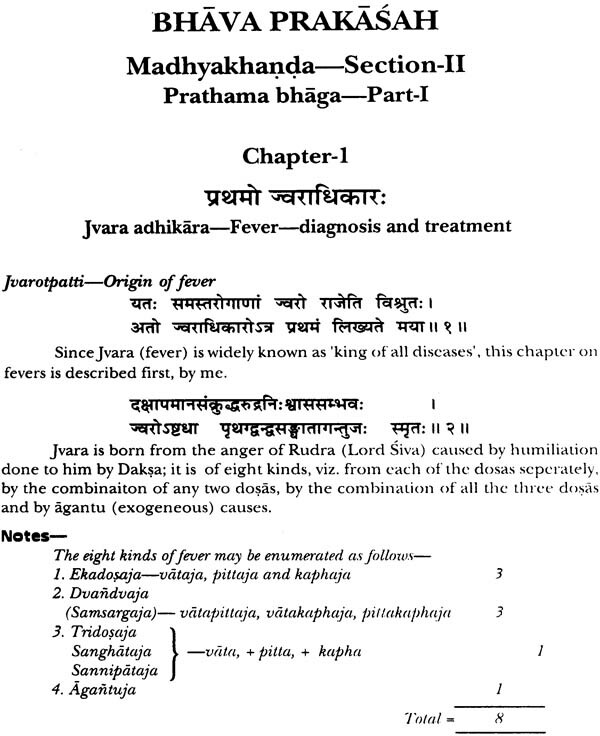 MadhyaKhanda— Middle/second section has 71 chapters dealing with the nidãna (aetiology), laksana (symptomatology), sarnprãpti (pathogenesis) sãdhyasãdhyatã (prognosis) and cikitsã (treatment) of all diseases, with greater emphasis on Kaya cikitsã (inner medicine). Both Kãsthausadha (formulae from vegetable drugs) and Rasausadha (formulae from mercury and minerals) ar mentioned in the treatment. 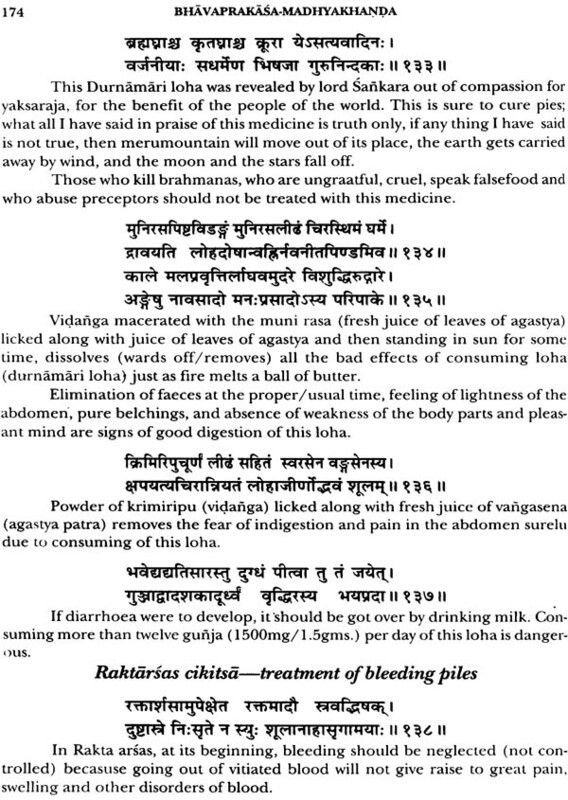 Uttara Khanda— Third and last section has only two chapters, one dealing with Vãjikaraiia cikitsã (virilification therapy) and the other with Rasãyana cikitsã (rejuvenator therapy). 1. First one— which has no specific name is available in full and printed along with the text. 2. 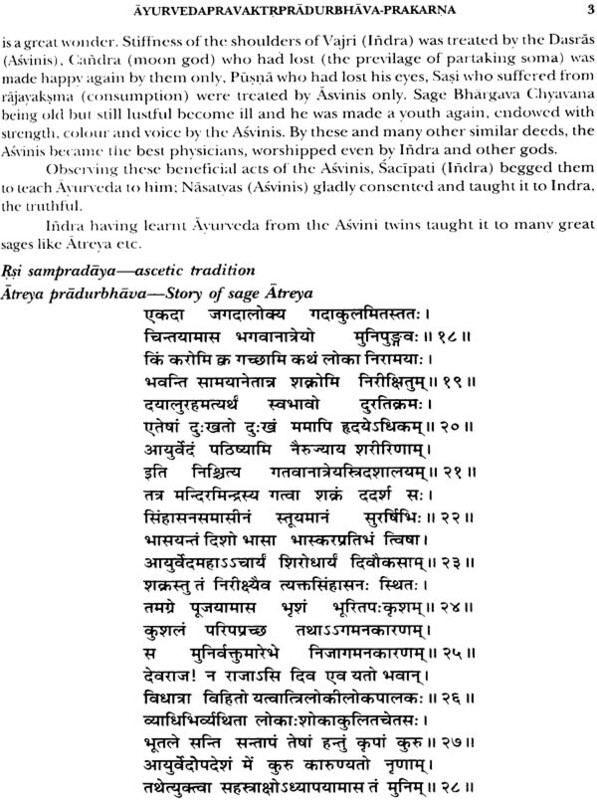 Second commentary by name ‘Sadvaidya siddhãñta ratnãkara” is written by Jayadeva, son of Jayakrisna on the orders of Maharaja Ranavira Simha, king of Kashmir2. This is incomplete and its manuscript is in the library ofJammu3. Regarding the first commentary available now, there are doubts about its authorship among the present day scholars, since there is no mention in it. Some scholars opine that Bhãvamira the author of the text is also the commentator; some others say, the traditional belief is that Bhãvarnira wrote only a tippani (short notes/ gloss) and not an elaborate commentary like the one now available; yet others hold the view that the commentator is a person different from Bhãvamira and has chosen to remain incognito. I am of the opinion that Bhãvamira himself is the author of the commentory also, as can be inferred from his own words’. The use of the words ‘Vyakhyana’ in this sentence makes it clear that what he wrote is vyakhyãna’ (commentary) only and not timpani-gloss/short notes. The commentary is neither too elaborate nor too brief, written in simple language and lucid style, furnishes quotations from other treatises mentioning their source, especially of the numerous medicinal formulae. It also explains many moot and doubtful points mentioned in the text, gives additional information about drugs and practice in vogue of preparing medicinal formulae and usage etc. Thus the commentary is very valuable and greatly helpful to understand the original text. The first edition of Bhãvaprakãa-full text together with its commentary was edited and published by Sri JIvananda vidyasagar Bhattacharya, Calcutta in 1875. This was the authentic copy of the manuscript and so considered as authoritative. 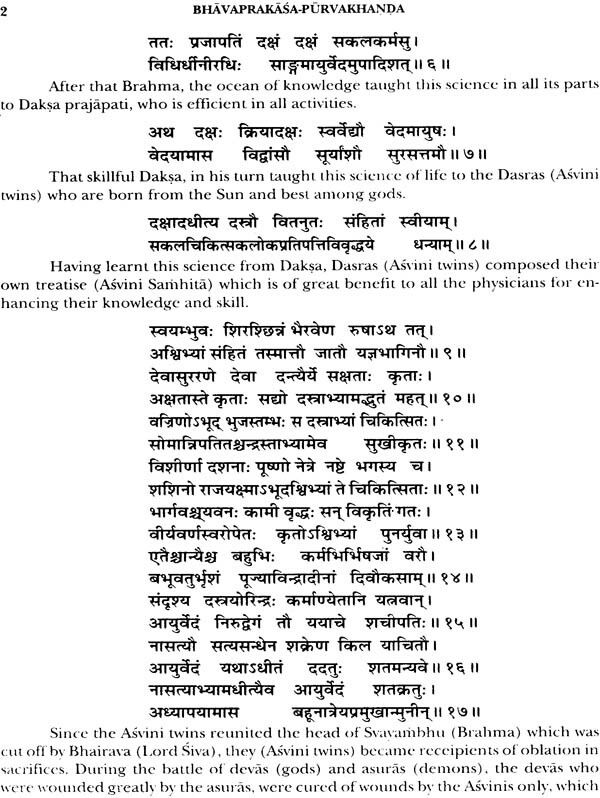 Since then it has been published many times, edited by different scholars; some editors have published the nighantu portion of the text only under the name Bhãvaprakaa Nighaxi tu2. Bhavaprakãa has been translated into Hindi and some other Indian languages, but not to any foreign language so far. This translation into English is the first in this category. Similar to my translation of other Ayurveda texts, this also is faithful to the original, relining on its commentary for the meaning of difficult words. I feel my labours amply rewarded if it can render an iota of help to students and practitioners of Ayurveda to understand and appreciate Bhavaprakaa. I have dedicated this volume to the memory of my preceptor Prof. M. Visvanatha Dvivedi. He was my teacher of Dravyaguiiavijnana (Pharmacology and materia medica) at the Post-graduate centre (now Gujarat Ayurveda University) Jamnagar during 1956-58. He was a great scholar in many subjects of Ayurveda, especially of Dravyaguna vijnãna. A prolific writer he has authored more than two dozen books, appreciated by teachers and students alike. Bhavaprãkãa Nighaiu edited by him with copies supplementary notes is a monumental contribution. His lectures were full of experience and highly beneficial. These have made me and my classmates indebted to him. This dediction is a small token of my reverence to my preceptor. Ere concluding, I convey my hearty thanks to Sri. C. Mahesh. B.Com. my second son-in-law, who gladly undertook the laborious task of preparing the Appendices and Index, thereby helping me in a great way. My daughter Smt. KS. Revathi. B.A. also deserves my thanks for typing the manuscripts as usual, year after year, with sincerity and devotion. Last but not least I convey my sincere thanks to Sri. B.M.D. Gupta M/s. 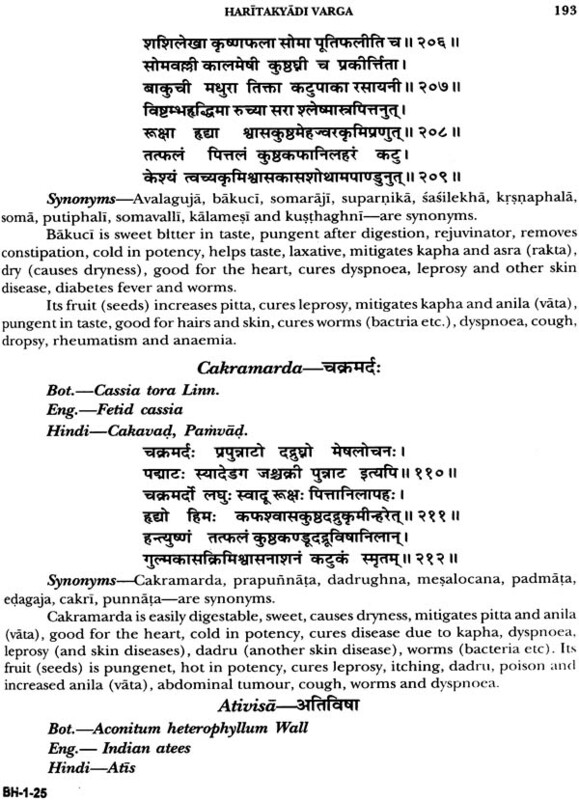 Chowkhambha Sanskrit series, Varanasi, the reputed Ideological publishers for including this book in their Ayurveda series.